Yesterday was crazy!! Somehow I mixed up Sunday and Monday and thought shows started an hour later. I was chatting on the phone to my daughter in Ontario when I realized my mistake. The first show was due to start and I was still in Richmond. After quickly calling Vancouver Fashion Week (VFW) to let them know - it was in the car and on the road. I literally ran from my parking space - changed to my high heels in the lobby and exploded through the closed doors to find the first show ready to start. Hugging people along the way all while being urged to sit, I made it to my seat. In sheer joy I performed a little happy dance on the runway to many a smiling face. I felt like 2 things in that moment - a celebrity being seated in front of the audience and the last passenger to enter the plane. 1. It should Melt In You Hand (for you techies that means be ergonomically perfect). 2. It should be technically perfect with no compromises taken. 3. It should look beautiful." If you haven't stopped by their booth. I would take a minute today as it's your last chance. I promise you'll be amazed. Now for my 4 picks. A tough day as always to choose. Takaokami - a unique line of rainwear I didn't get a chance to include here - had my runway moment of the day. 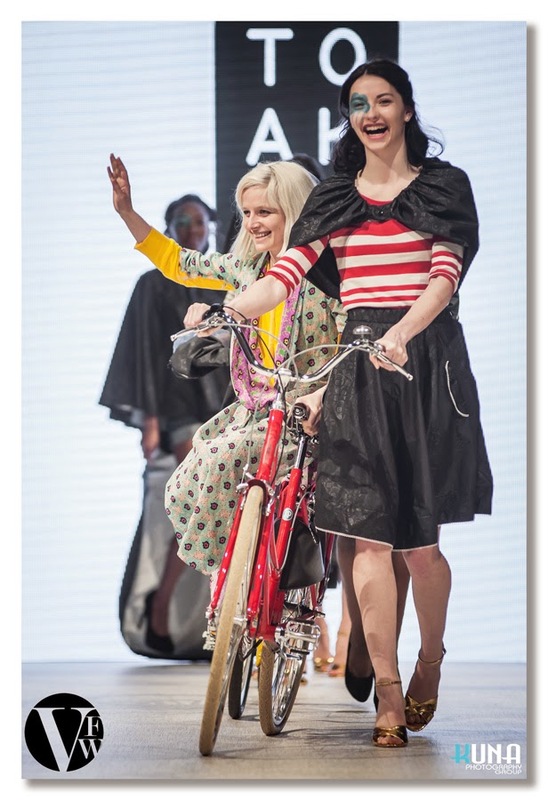 The designer started the show with a model riding a bicycle in gold heels and then came out for her bow seated on a bike with the same model was pushing it down the runway. In honour of her creativity I have put her as my lead image above. Be sure and check out her runway pics as the pieces were amazing! ERIKÓ. 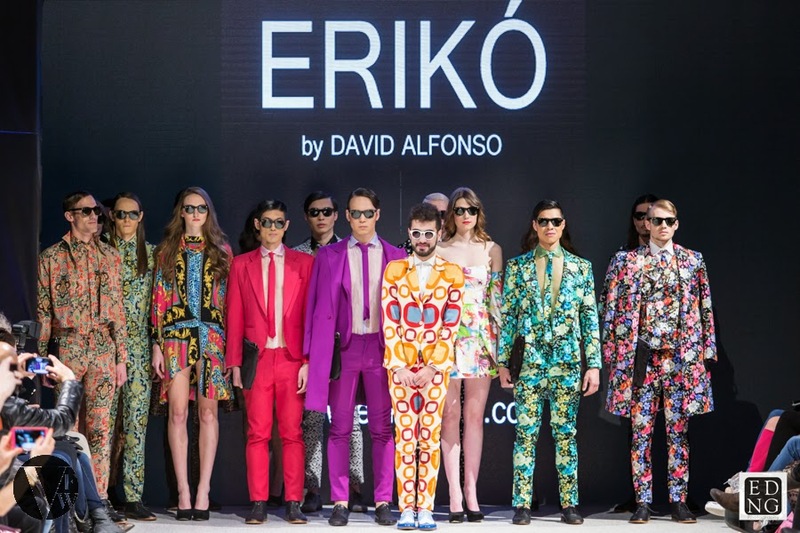 By David Alfonso was a great show stopper collection to start the day. Bold, colourful and full menswear in unexpected prints - the line's Creative Director had the audience in his hands from start to finish. Alfonso was working as an architect Colombia when the siren call of fashion came. After studying design in Buenos Aires, Argentina, this talented artist decided to return home and launch his own unique brand of menswear. He chose to address the lack of WOW in menswear and embraced colour, texture and daring to express the male identity. The line is risky, modern and versatile - designed for a confident man sure of his masculinity and ready to take centre stage when it entering a room. There were several things I loved about this collection. First was the choice to present every 2 mens looks with a complimentary woman's look. It gave balance on the runway and allowed us to see the looks in a group setting. I also loved the mix of prints. While I think most remember the bright florals, if you look above at the images, you'll see a the true range that includes some not quite as vivid, but still unique, choices. It's also amazing to see someone take menswear out of the box it's been in for decades. Lastly I loved that when designer David Alfonso came out for his bow. He out-shined everyone with his bold suit, great eye wear and fantastic blue shoes. I had just a brief chance to say hi later in the evening and found him warm, vibrant, uber friendly and full of smiles for each person he talked to. How do you follow such a bold show? With something totally opposite of course. That's what keeps everyone on the edge of their seats through a long night of shows. Sirette by London designer Veronica Gargallo Llamas was the perfect choice. Born and raised in Barcelona, Spain, she recently graduated with her Master in Fashion Design from the London College of Fashion. The collection we saw this evening - titled Sugar Rush - was her grad collection with an additional 5 pieces. The designer looks to find inspiration outside the fashion industry to help her create a label that is unconventionally unique and this collection has an interesting one. While the description offered on the brand's Facebook page is "a playful, fresh and feminine take on classic shirting." it is interesting to note that the inspiration actually came from medicine. Here is an excerpt from her interview with Lorenzo Schober in The Province, "The prints used in Sugar Rush are blown up images of the fallopian tube, the trachea, and the lower intestinal tract...The concept of Sugar Rush revolves, on a micro scale, around the immune system attacking itself due to illness such as diabetes, and on a larger scale towards theories on society’s inclination towards auto-destructive practices." While this all sounds very intellectual, the final looks were soft. Pastels fabrics from sheers to wovens, plain and printed, were shaped into very young, feminine silhouettes. Flared skirts gently swayed. It took one away to warm breezes, balmy afternoons and gentler times. First bold, then soft - then came the next show by Pierre Renaux which was futuristic and sculptural. According to his Facebook page, he is from Concarneau, lives in Paris and is a former intern of Thierry Mugler. I believe this is the designer's Master's of Fashion Design final collection shown at graduation from the Royal Academy of Fine Arts in Antwerp, Belgium. With the real work world fast approaching, this was his chance to create a collection where he could control every aspect from concept to final look. It was inspiring to say the least. Rather than try to explain all the intricate shapes and silhouettes in this black/white/gray collection, I would like to offer the designer's own words. "Anticipating [graduation] resulted in the 'clearance sale' or 'everything must go' principle, translated into a womenswear collection that shows garments that are in the middle of being ruined and/or dissolved. At the basis is a business woman's attire, the image of a cold, god-like, controlled woman, 'the last woman standing' of a company, a CEO who had to fight in order to say what she wanted to say, and who wears suits as rigid, armour-like garments. It is contemporary formal attire with a twist: the synthetic materials (neoprene, wax, plastic) are being distorted, twisted and appear to be melting or seem to consist of glass shards. They are mutating. Each silhouette contains the tension between a kind of coldheartedness and more sensual shapes, between strength and softness." The perfect finishing note in styling was his unbelievable 3D printed shoes! I would kill for a pair in black - hint, hint! Excellent show! Very inspiring! I was so excited to see Ipek Tohumcu - from Istanbul, Turkey - back on the runway and having her close the evening was just the right note. You can read about her previous appearance HERE. Tohumcu is from a family of silk producers and worked as a designer for several well-known companies. One mentioned in particular was working under the supervision of Mario Lupia - owner of Giorgio Sant Angelo. The designer is also a highly skilled colorist who teaches at the university level to a wide range of disciplines including students in Architecture and Interior Design. I am a huge fan. Her aesthetic is truly original, the tailoring is impeccable and the detail work incorporated into the garments is intricate and oh so stunning. Looks seen in this collection take you from day into evening and are created in fabrics ranging from silk to leather and wool. Individuals pieces complement a woman's figure without being overly body hugging - comfort and fashion in one beautiful union. Artistry is in evidence throughout in the use of colour, the way separate fabrics are blended, in the considered placement of unique embellishments and in the designer's sculptural use of both stiff and fluid materials. While I had several favourite looks, probably the top 2 - despite my huge love of colour - were the eye catching black/white pieces. In the top photo strip on the left I adore the knee-length coat paired with red gloves. In the bottom strip 2nd from left is a great white jacket with red trim paired with black pants. I would wear this in a second. Another great show by Tohumcu and I was glad to be there to see it.